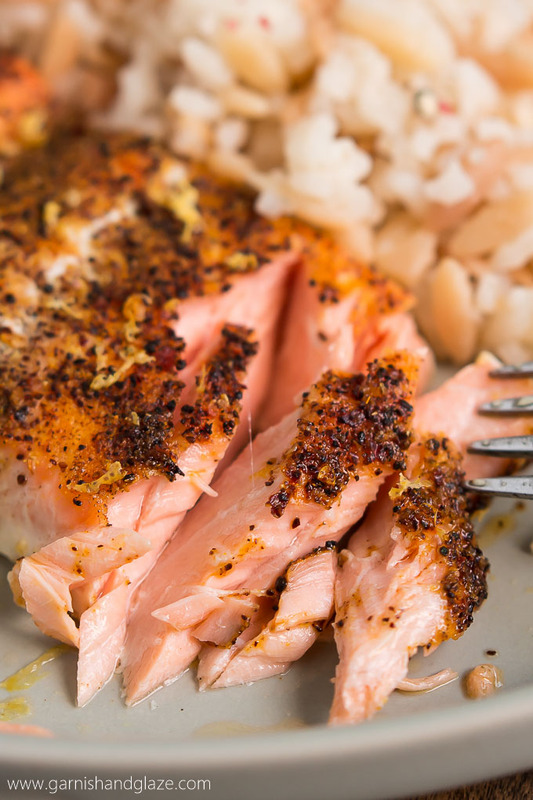 Salmon is one of my favorite proteins to make for dinner. It’s healthy, easy, fast, and tastes fantastic! And it’s super tender and juicy. Not only do my husband and I love this Simple Salmon Asparagus, my three and one year old do too! Carly eats almost as big of a serving as I do. With my husband in medical school, gone at clinic and studying, he doesn’t have much time or the energy to dedicate to working out so he’s been trying to make sure he eats healthy. This is one of his favorite meals because it’s filling, fast (he is starving when he gets home), low calorie and high protein, and tastes awesome. 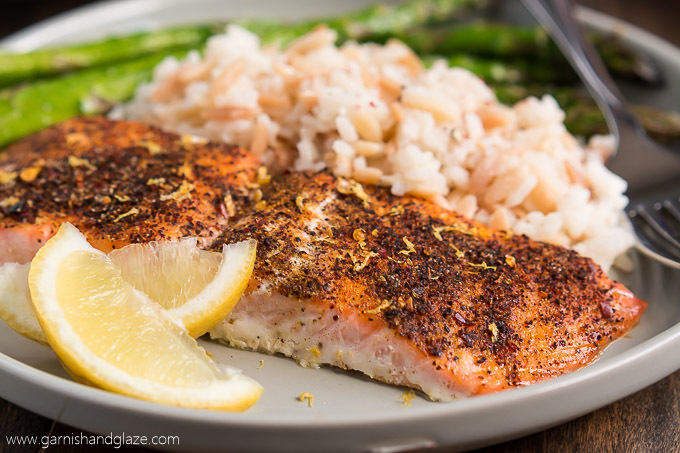 So all you need to do is get some rice cooking in a pot (this Orzo Rice is my fav with salmon) and then place the salmon and asparagus on a large pan. Sprinkle the salmon with the seasoning mix, the asparagus with some garlic salt, and pop it in the oven. 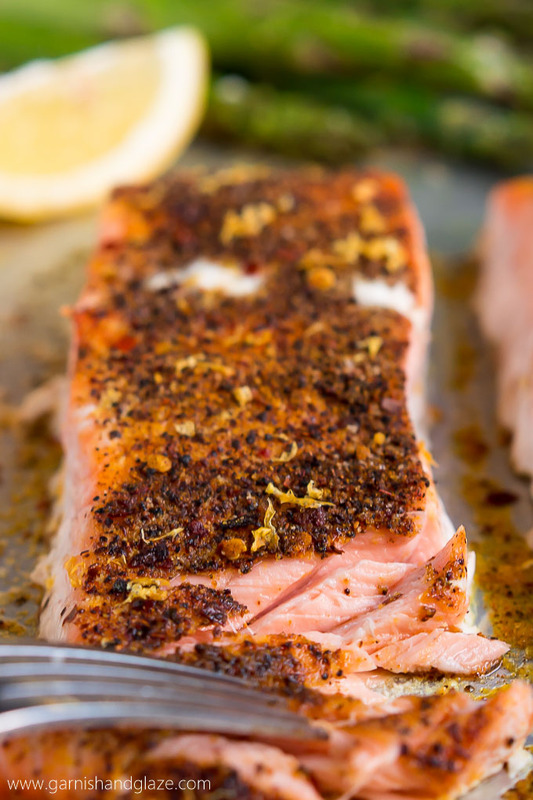 To cut down on calories I just lightly spray the fish with cooking spray and then sprinkle on a mix of spices which is a copycat recipe of a salmon spice that use to be sold at Costco. Doing this also eliminates a marinade which usually ads calories and longer prep time. 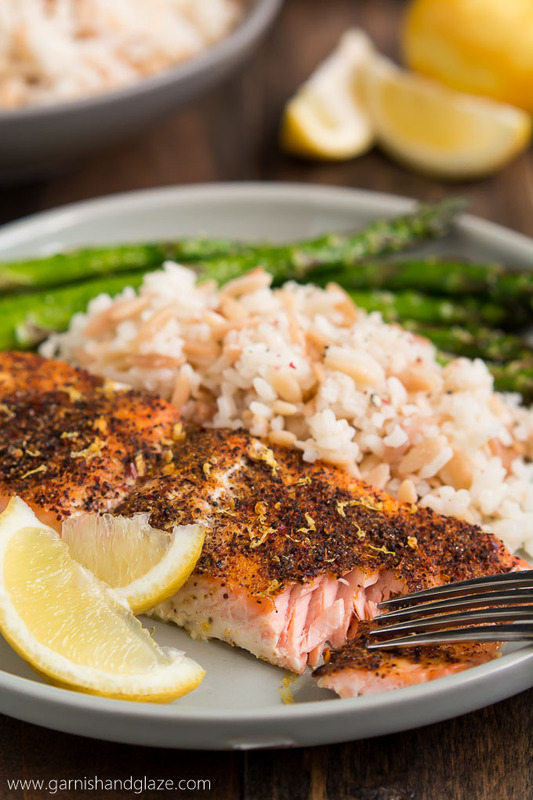 Try this Simple Salmon & Asparagus tonight! If you want more salmon recipes you’ve gotta try my Teriyaki Salmon Stir Fry. 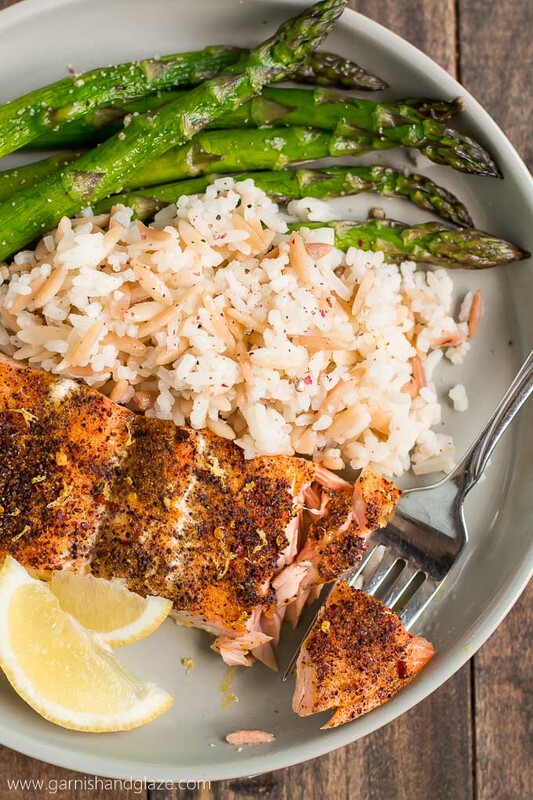 Place salmon and asparagus on a greased pan. Spray top of salmon and asparagus with olive oil cooking spray. 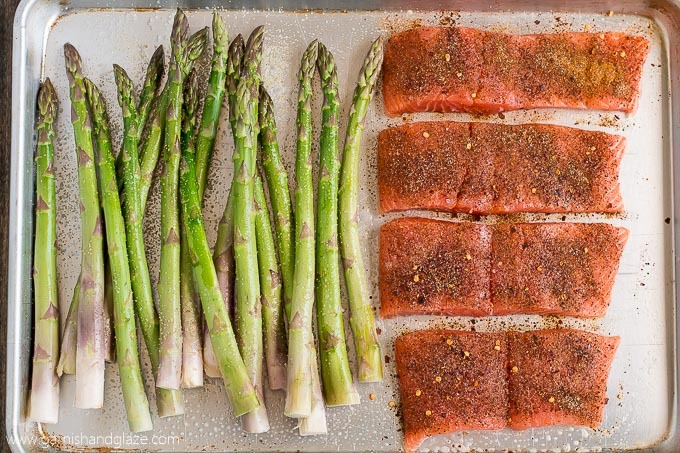 Sprinkle the asparagus with some garlic salt and the salmon with the seasoning mix. Bake for 12-15 minutes until fish flakes (145 degrees F). I made this salmon with coconut rice last night, delicious! I will definitely be making this recipe again in the near future. 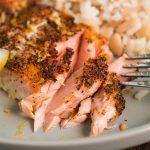 My boyfriend (who is not real big on salmon) said, “This is the best salmon I’ve ever had!” Thank you for this recipe, it is so simple, yet so delicious! I love hearing that! And I’m totally going to try it with coconut rice. Sounds yummy! I tried this for my boyfriend and I tonight and it was great! Made this today and it was quick and quite delicious! I lightly coated the salmon and asparagus with grapeseed oil instead of the spray cuz I don’t like the spray. I will be making this again. Julia, I’m so happy you enjoyed it! Great, quick meal and flavourful! Lemon zest at the end rounded out all the flavors nicely. Thank you!